The Matthews Town Board this week held a public hearing on a proposal to create a new Zoning Overlay District that would make the land use and development policies in three Small Area Plans enforceable on all new development, regardless of whether or not a rezoning is involved. The E. John St./Outer Loop Small Area Plan (page 172 of the Town’s Land Use Plan), covering an area south of the I-485 / E. John St interchange. While a Land Use Plan serves a policy guide, a zoning overlay district has the force of law on all property in its defined geography, and supersedes any zoning rights in the underlying district. The proposed Overlay District would incorporate policies ranging from building design to lot setbacks, and apply to both new development and redevelopment in all three Small Area Plan geographies. 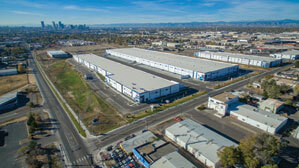 Long-term planning and collaboration among various partners across multiple jurisdictions have been key to creating a new industrial park in Denver’s Globeville neighborhood. More than a century ago, the Asarco Globe Plant was operating as a metal smelting facility, employing nearly 3,000 Coloradans in Denver’s culturally rich Globeville neighborhood. Over the years, an array of industrial processes and uncontrolled disposal on-site contaminated the groundwater and soil with heavy metals. This contamination resulted in the property being identified as a brownfield site, and decades of investigation and remediation began. The City of Concord invites the public to get the first glimpse into the policies and maps that will guide the development of the community over the next 10-15 years. The 2030 Land Use Plan public input session is scheduled for 6:30 p.m. on Tuesday, October 10 CFA Village Suite 75 located at 280 Concord Parkway N.
With the assistance of Tindale Oliver, Planning and Neighborhood Development staff have been working to update the City's Land Use Plan to provide the framework for land use and development through the year 2030. The existing Land Use Plan, referred to as the 2015 Land Use Plan, was created in 2004 and updated in 2007. The process is updating a land use map and supporting text document that contains data, specific goals, and policy recommendations focused on land use and development. The final plan will also guide City officials as they develop future budgets, plan infrastructure and other services, make important land use decisions, and revise current policies within the Concord Development Ordinance.